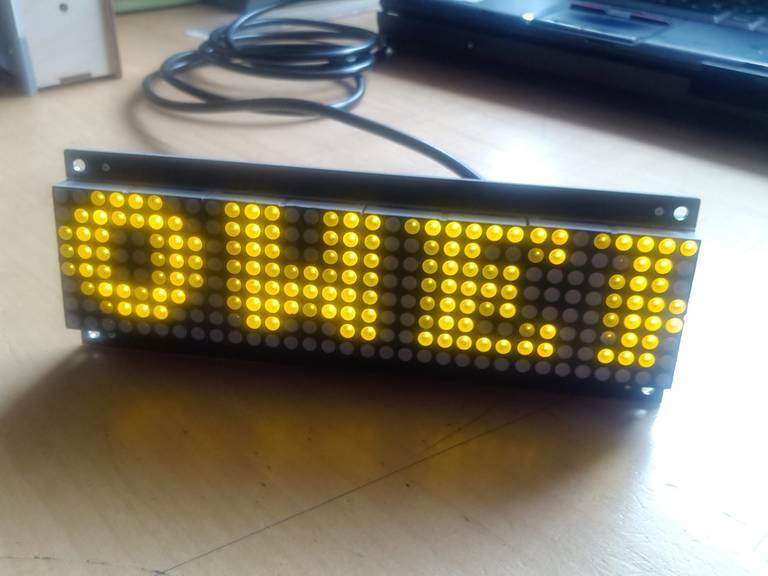 I’ve been messing around with some 32 x 8 LED displays – as I have been wanting to create graphics. 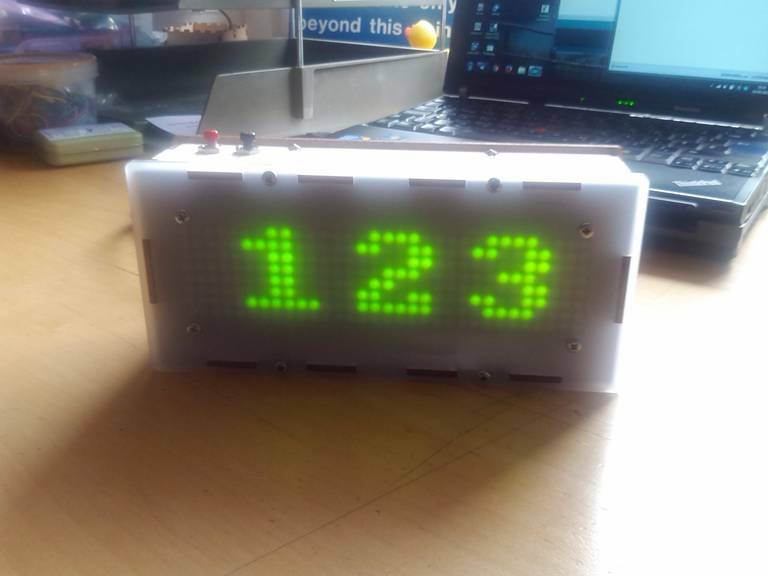 These LED displays are from Sure Electronics are available for around $13 and use the HT1632 LED driver IC, with an SPI-like control. I have previously used these displays for a couple of projects here and here. 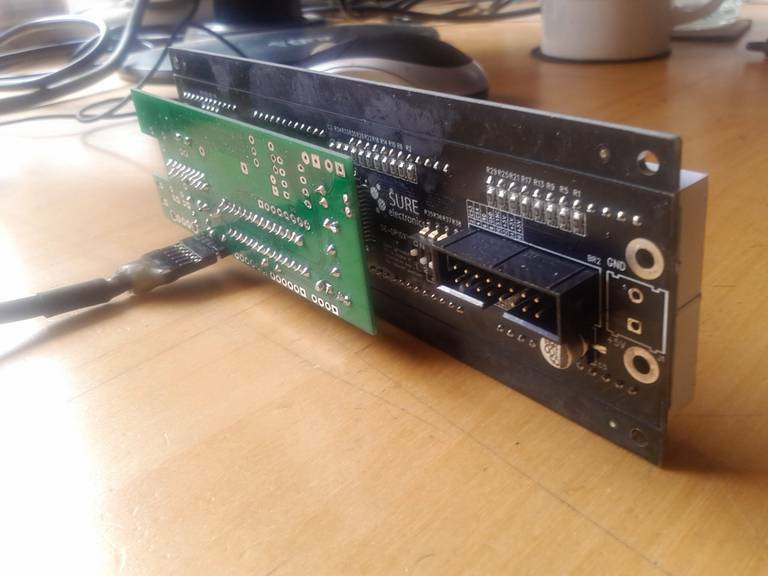 I have designed a new circuit board which plugs directly onto the back of these displays and contains a ATMEGA328 with the Arduino bootloader, a real time clock, a temperature sensor and a couple of input switches. The notes here show the device in action and how I created some bespoke graphics for the displays. Scrolling text on the display. 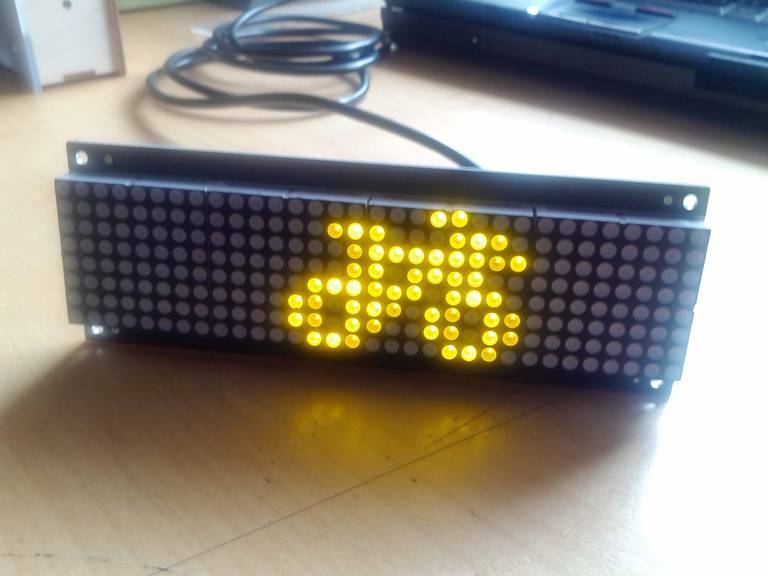 A bicycle scrolling across the display. 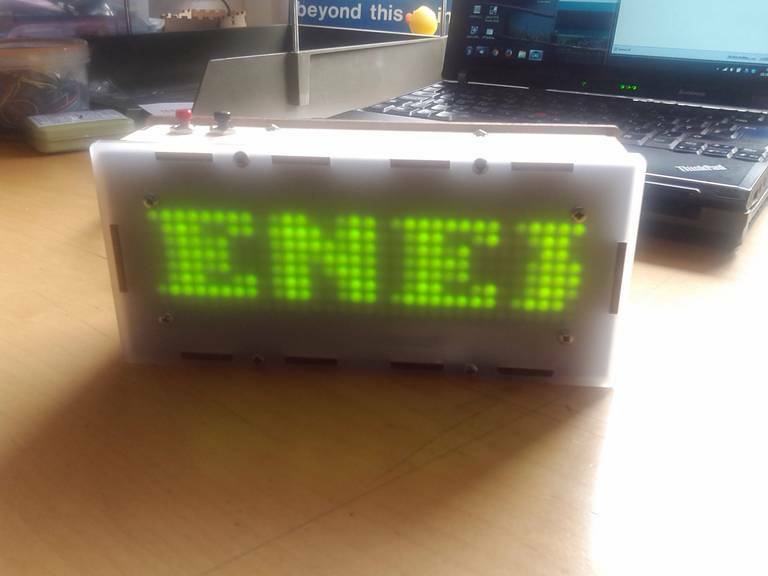 The circuit board I had designed had a couple of problems – a couple of components got in the way of components on the LED display and so had to be bent down so the LED display would fit. 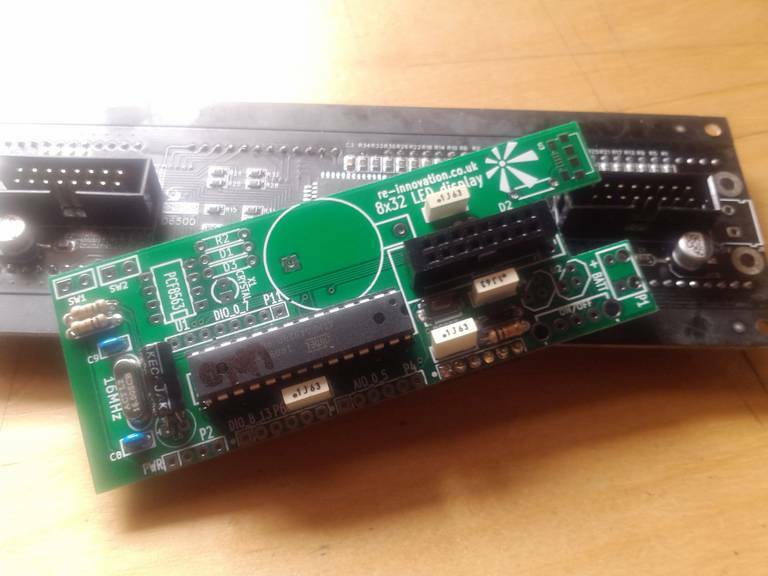 This works OK, but is not good enough to supply these PCBs in a kit. 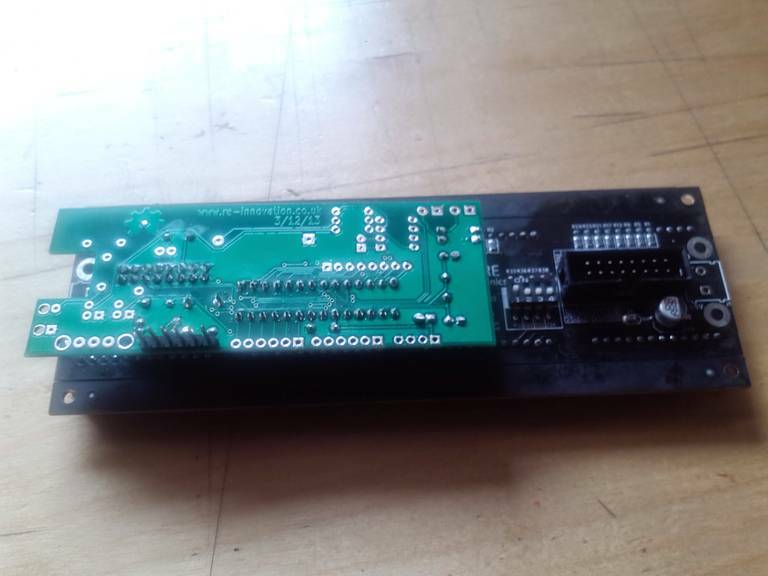 I’ll redesign the PCB and have a few of them in stock. I needed to upload an Arduino sketch to run the LED board. 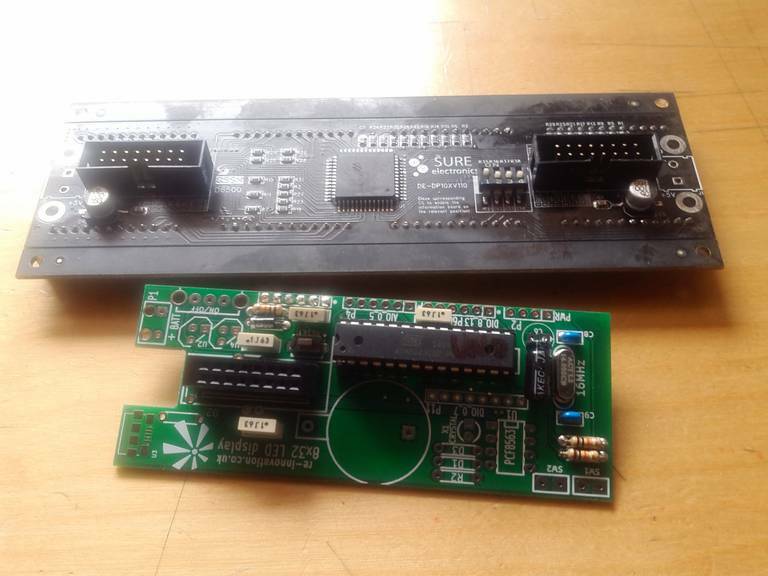 My previous projects with these boards were a couple of years ago on an earlier version of the Arduino IDE. 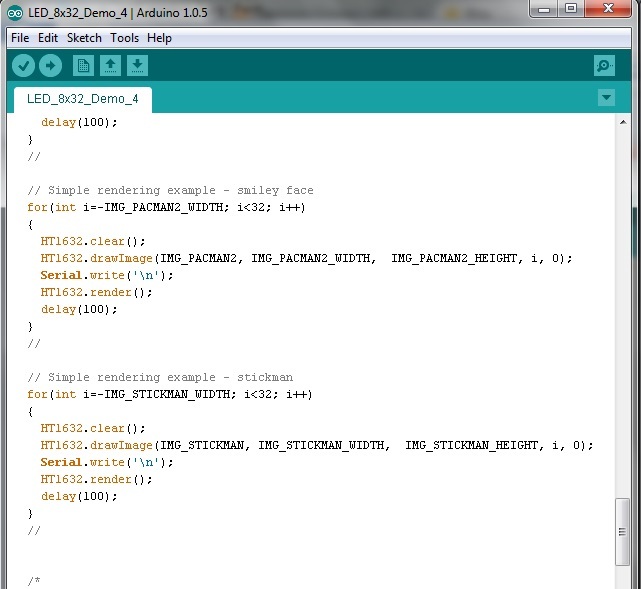 When I tried to upload the code using the latest version of the Arduino IDE (1.0.5) there was a compile error. I downloaded this and copied it to my Arduino Libraries folder. This did not work straight away and took a little bit of head-scratching to get it to work. It turns out that I needed to set the display as 8 bit high and PMOS (the default was NMOS). I think the manufacturer changed this when they did a new batch of PCBs, hence some displays are NMOS and some are PMOS. 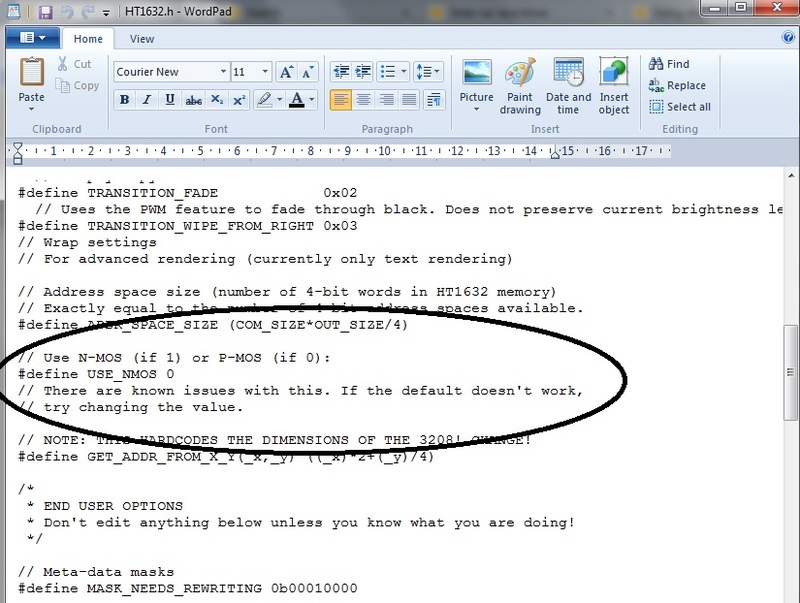 This must be done within the HT1632.h header file, which is within the HT1632 libraries folder. For the LED display version I used I needed to change the #define USR_NMOS 0, as the LEDs are controlled with P-type MOSFETS. This is not obvious and not marked on the display anywhere. This is the line to change within HT1632.h file, which I edited using wordpad. This did not output the data in the format that I would like. The required format are 4bit nibbles for the top and bottom sections of each line of the display. 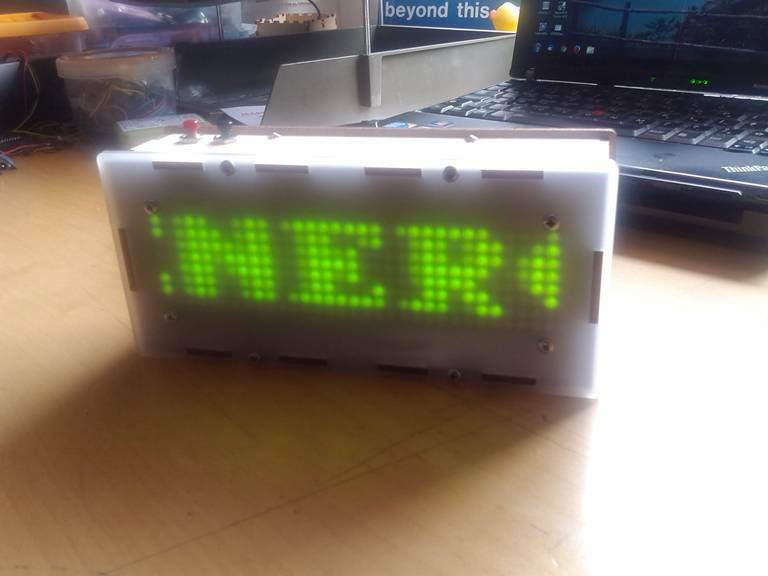 I decided to mess around with the arduino code to get it to read hex values rather than 4bit nibbles. I could not find an easy way to do this so I created a slightly convoluted tool chain which I list here mainly to remind myself. I realise that I could also sort out the design tool to be able to automatically do this (and one day, maybe I will), but I needed to quickly get a small graphic displayed. 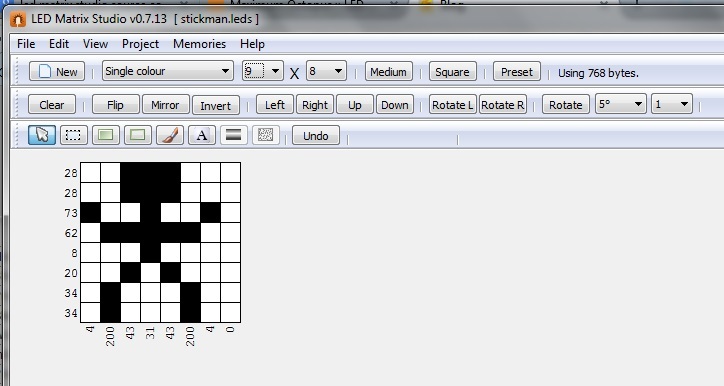 Create the graphic (using the grid and clicking on the boxes). Rotate it left by 90 degrees. Click on File -> Export and it brings up a dialog box. 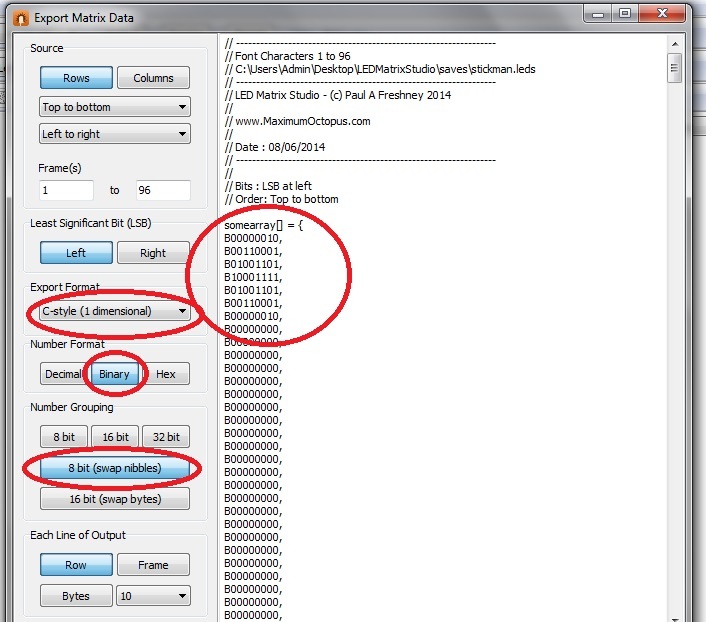 Click the options: Export Format “C Style (1 Dimensional)”, “Binary” and “8bit (Swap Nibbles)”. 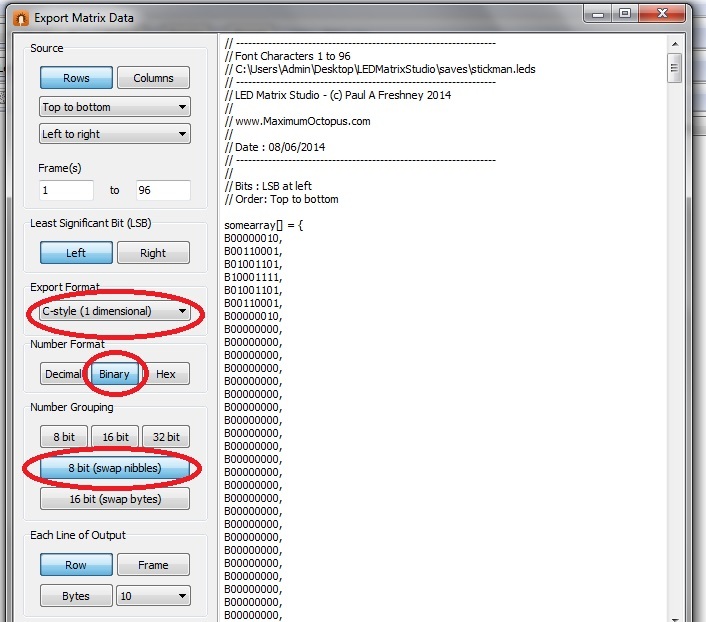 You will see the data in the output pane on the left hand side. Copy the binary data which appears. 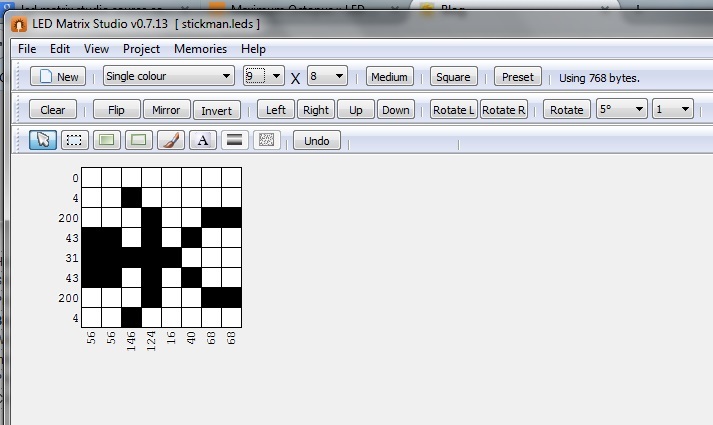 In this case I am creating an 8×8 graphic, so I select 8 rows. Open the “images.h” document in some kind of editor. Create a new graphic and give it a name (I use IMG_**NAME** for these). You also need to create a IMG_**NAME**_WIDTH and IMG_**NAME**_HEIGHT values (in this case 8 by 8). 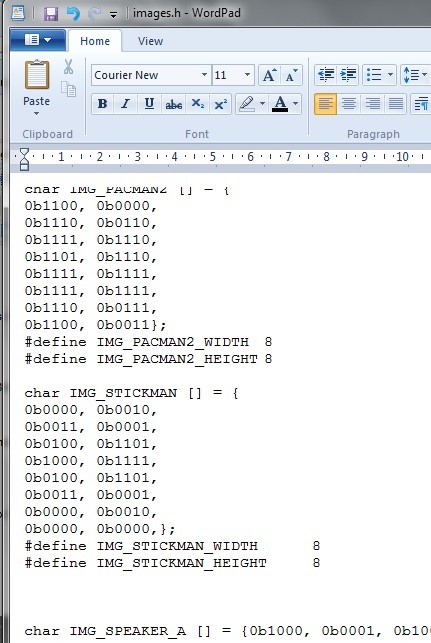 We then need to split it into 4 bit nibbles – and add the Arduino prefix 0b to indicate it is binary information. 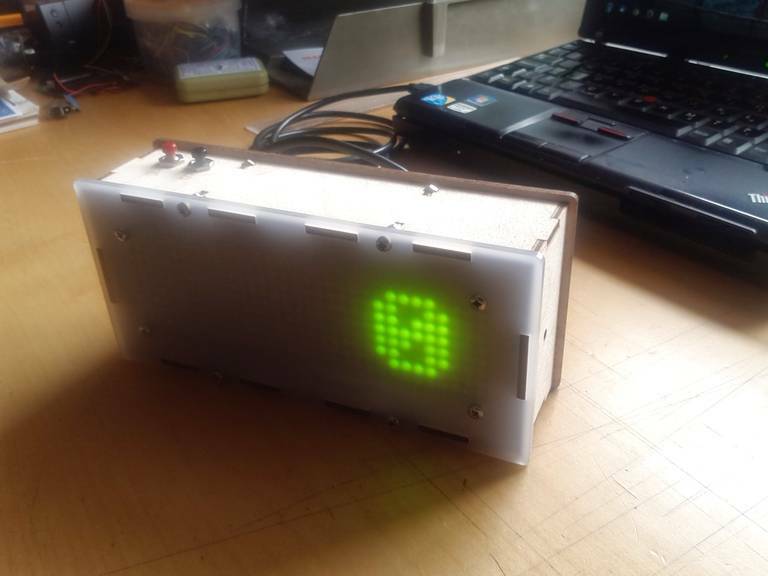 Open the example Arduino code and create a new image to display. The problem with the HT1632 arduino library was that the data needs to be in the 4 bit nibble format. The solution above is OK for small graphics, which can be converted from 8bit data into two lots of 4bit nibbles by hand. With a whole ASCII font this become a greater challenge. 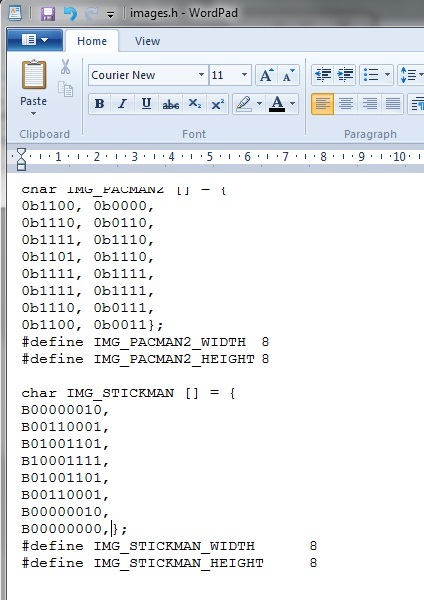 Each number, symbol or letter is a 8×8 graphic (around 120 in total, upper case and lower case) and each would need chopping from 8bit data to 4 bit data, the 0b prefix added. The data within each nibble must also be reversed, which made this task terrible to do by hand. This was due to the format of the 8×8 font I decided to use. So I tried to do this using software. 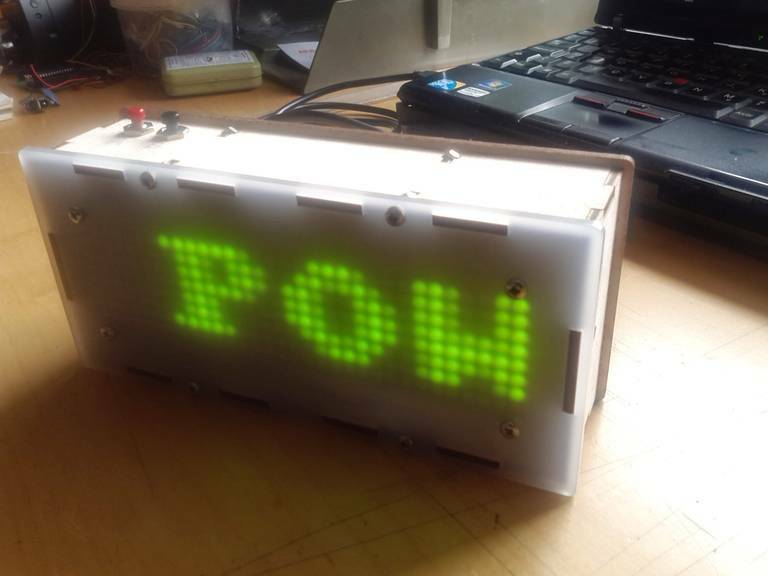 Thanks to fellow hackspace member Iain Sharp who wrote the code while my head was in a muddle. // Each 4 bit nibble is mirrored.